Monacoâ€™s owners have backed Thierry Henry as coach, just hours after his side were beaten 4-0 by Paris St Germain to extend Henryâ€™s winless run to six games. 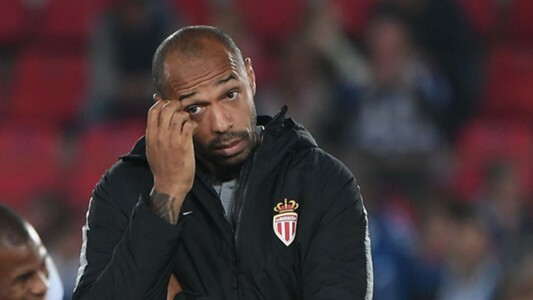 Vadim Vasilyev, Monacoâ€™s Vice-president, said they would not bow to mounting pressure and fire Henry, who has drawn two and lost four matches since succeeding Leonardo Jardim. â€œThierry Henry came for the long term, he is not a firefighter,â€ Vasilyev told French TV channel Canal. The former Arsenal and Barcelona striker took over in the principality last month, but has struggled in his new role at last seasonâ€™s Ligue 1 runners-up. Injuries have played a part, with several first-team players unavailable and a strategy of selling top players has hardly helped instill the club with a sense of stability. Bernardo Silva, Benjamin Mendy and Kylian Mbappe are among those who have left in recent years. They are already out of the Champions League, after taking just one point from a possible 12, and they sit joint bottom of Ligue 1 standings with seven points from 13 games. Monacoâ€™s next game is on Saturday at Caen, who are two places above them in the Ligue un table.